A Response to the Question, "Should I Give St. Elsewhere a Chance?" To those who have heard about the show and wonder what the big deal was--here's what to look for in watching St. Elsewhere. 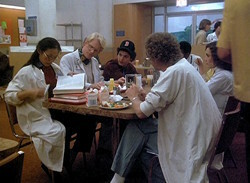 A scene from season one, the Joshua Brand-John Falsey era. A while back, I came across a discussion forum for former St. Elsewhere showrunner Tom Fontana's gritty 90s police drama, Homicide: Life on the Street where a poster, underwhelmed by the episode of St. Elsewhere he caught in reruns, asked other posters if it's worth watching more of the show. I can't find the post anymore, so it could be gone. If anyone tracks it down, they are welcome to post the link in the comments section. Then recently, I got a Google Alert for a similar page on Reddit, where a user asked if the two Joshua Brand-John Falsey creations St. Elsewhere and Northern Exposure were worth watching all the way through. I posted my response on the Reddit page. You might not expect this from the proprietor of a fan site, but I wouldn't recommend the show to everyone. It's really not for everyone's tastes or sensibilities. But if you get it, the show's pretty damn good. If you're here on this website, odds are you that have watched St. Elsewhere and are looking to have your memory refreshed. So I don't need to preach to the choir. One thing to consider is that it's not easy to even see the show. You can watch it on Channel 4OD in Britain, but not in North America. There are only a few cable channels that show reruns (including iChannel in Canada). On DVD, you can buy the first season, which I feel to be the weakest and not really representative of what made St. Elsewhere special, but not seasons two through six, where the show takes off. If you're not inclined to buy bootleg DVDs of the complete series, you can't access it. If you're open to watching television from a bygone era and you like getting hooked on a series with continuing storylines and long-range character development, St. Elsewhere is quite rewarding. If you've got a quirky sense of humor, relatively sophisticated cultural sensibilities, and knowledge of baby boomer culture, there's a lot to like. 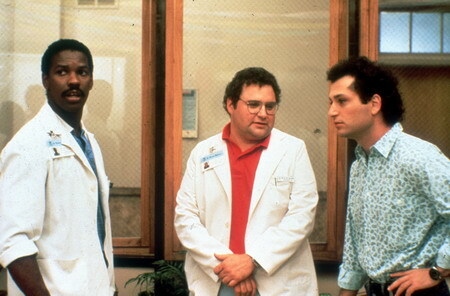 doctors Chandler, Axelrod and Fiscus. If not, you might at least be interested to see a medical show where Denzel Washington, Mark Harmon and Howie Mandel were some of the doctors on staff. I would hope that's at least slightly interesting. I think it's a damn strange mix of actors, but not really, considering they were basically unknowns before St. Elsewhere. St. Elsewhere's dialogue is filled with puns, inside jokes, and references to pop culture, often thrown into serious scenes; guest stars frequently have lines that refer to their other work. In their biggest stunt casting move, they cast five of the original Tonight Show players as parents of the residents: Steve Allen, Jayne Meadows, Bill Dana, Louis Nye, and Tom Poston. The show celebrated the tragedies and triumphs of life, commented on religion and politics, and explored the challenges and limitations of healthcare. It's as rich as a great novel, and was widely honored for its writing, including two Emmys and a Peabody. And there are a ton of great acting performances from cast and guest stars. Emmy awards for acting were bestowed upon Ed Flanders, James Coco, Doris Roberts, William Daniels and Bonnie Bartlett, and nominations went to Ed Begley, Jr., Christina Pickles, Piper Laurie, Alfre Woodard, Edward Herrmann, Steve Allen, Jayne Meadows and Lainie Kazan. There are video clips of St. Elsewhere out there if you look for them. You can watch the saga of Mrs. Hufnagel on this playlist as an example of how they made a great story out of a bit part. I intend to keep more clips, stories, retrospectives and features coming, all to celebrate the many things I've enjoyed while taking in the world of St. Eligius. That's how I'll make my case. Would you say there are any particular moments or episodes from season 1 that show the Fontana/Masius era's style emerging? Good question! I haven't watched season 1 in a while, so I'm going by the descriptions I just skimmed... I don't think so. Maybe the one story that stands out for me, oddly enough, is from the final episode of the season, where Dr. Auschlander reunites with an old friend and gets into a brawl in a road-rage incident (back before we called them that). They know their best days are behind them, but for a moment, they got to feel vital again. I think it's because the story actually feels good. A lot of the stories from season one (again, based on the scan of the descriptions I just did) are dramatic because they're a DRAG. I'd say it wasn't for nothing that Brand and Falsey were nicknamed Dr. Death and Mr. Depression! One random thought I had involved the Tinkers, Grant the Patriarch, and President of NBC during most of the '80's and sons Mark and John. Both had pivotal roles in production and writing, moving up the ranks and ultimately Executive Producers in the latter seasons. It was their skills and abilities that led to promotions from Bruce over the 6 year span of the series, but there was some fatherly favoritism along the way, as the show had mediocre at best Nielsen ratings during its entire run. However, St. E owned its Wednesday 10-11 time slot in advertising dollars due to high viewership among the most highly sought after demographic - males between 25- 45. Sorry for the digression, but Grant was being pressured by other NBC executives to cancel the show but he stood his ground because of the show's quality AND, maybe it's conjecture, but I have heard this from St E insiders, that he fought so hard, as any good dad would do - to keep his boys employed! Anyway, I just found this site - awesome! I'll be chiming in from time to time to time with my long, assed boring stories. But I do have some really good ones that I think viiewers of this site might appreciate. Hi Joey, Great point! The Tinker influence is definitely a major factor in St. Elsewhere's run. If you'd like to contribute stories/thoughts/observations to the St. Elsewhere Experience beyond comments, I'd gladly accept your contributions! Send me a message through the contact form if you're interested. I loved St. Elsewhere in its first run during my youth. I have recently been re-watching the entire series recorded years ago from television. The first season definitely left a lot to be desired compared with the remainder of the show. Among the dramatic stories from that season I did enjoy were 1) the man with Gosher's disease, 2) the way the Tim Robbins storyline played out (and came back to haunt Dr. Morrison in later years), and 3) the Cora and Arnie storyline. My all time favorite episodes, though, are the "Time Heals" episodes from season 4, and "After Life" from season 5.